US Secretary of State Condoleezza Rice has demanded that Russian forces withdraw from Georgia immediately. It comes after Georgia's president signed an EU-brokered ceasefire deal, after nearly five hours of talks. In angry comments at a news briefing in Tbilisi, President Mikhail Saakashvili said his country would never accept the loss of any of its territory. The crisis began when Georgia sent troops to the breakaway region of South Ossetia, sparking Russian intervention. Georgian forces launched a surprise attack on 7 August against separatist militiamen that it accused of attacking civilians in South Ossetia. Scores of people have died since the fighting began and tens of thousands have been displaced. President Saakashvili said he had signed the six-point ceasefire agreement - brokered by France - but that it was not a permanent solution. It includes a pledge to pull all troops back to their pre-conflict positions, and a plan to begin international talks about the future security and stability of South Ossetia and a second breakaway region, Abkhazia. Mr Saakashvili denounced the Russian invasion, referring to its forces as "cold-blooded killers" and "barbarians" - he said that Georgia was now "looking evil directly in the eye". He also accused the West - especially European countries - of inviting Moscow's military action by failing to offer his country Nato membership earlier this year. Ms Rice said that Georgia's acceptance of the plan meant all Russian combat forces should now withdraw, and she called on Russia to co-operate in getting international observers in place. In a telephone call, Russian President Dmitry Medvedev told his French counterpart, Nicolas Sarkozy, that his country would sign the ceasefire agreement, French officials said. "[Mr Medvedev] confirmed that he would scrupulously respect its commitments to the accord, notably the pull-out of Russian forces," the statement said. Meanwhile, the campaign group, Human Rights Watch, said it had evidence Russian aircraft attacked populated areas of Georgia with cluster bombs, which are banned internationally. A senior Russian official denied the allegation, saying the report was a "well-prepared lie". 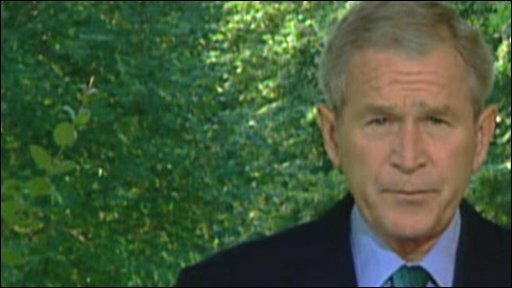 President George W Bush has accused Russia of "bullying and intimidation", saying it was an unacceptable "way to conduct foreign policy in the 21st Century". 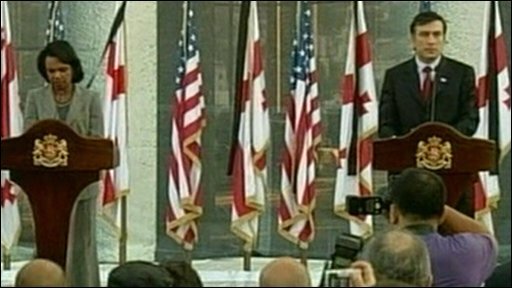 Speaking at the White House, Mr Bush demanded that Moscow respect Georgia's territorial integrity and withdraw its troops - or risk international isolation. President Bush: "Russia must respect the freedom of its neighbours"
"Only Russia can decide whether it will now put itself back on the path of responsible nations or continue to pursue a policy that promises only confrontation and isolation." At the same time, after talks with President Medvedev in the Black Sea resort of Sochi, German Chancellor Angela Merkel described the Russian response as "disproportionate". 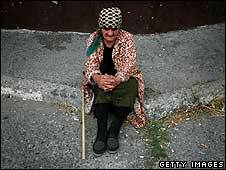 But Mr Medvedev said Russia was the "guarantor" of the interests and lives of those in South Ossetia and Abkhazia. He said they trusted Russian troops, and that this had to be taken into account. Mr Medvedev said he did not want to damage relations with other countries but that Russia had to fulfil its peacekeeping mandate, and that it would respond in the same way to any future attack on its troops or citizens. He added that a new deal to base part of a US missile defence system on Polish soil was aimed at the Russian federation. Washington - which says the timing is not linked to the Georgian crisis - insists that the shield is to protect against "rogue states" such as Iran. But, says the BBC's Jonathan Beale in Washington, the US is now likely to be less worried about Russian objections and more anxious to send signals to European allies like Poland that it is prepared to guarantee their protection. 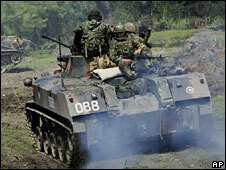 Moscow's troops continue to operate deep inside the Caucasus republic, occupying parts of at least three major towns. There were reports of Russian armoured personnel-carriers moving closer towards the Georgian capital, setting up a new checkpoint about 35km (22 miles) outside Tbilisi. The BBC's Richard Galpin, in the Georgian port of Poti, says Russian forces have taken control of the naval dockyard - with the apparent intent to destroy or remove Georgian military and naval equipment. There was also a major Russian military contingent further inland, at Senaki, where Russia said it has seized a large depot of American-made arms. Russian forces still control Gori, which lies some 15km (10 miles) from South Ossetia, but say they are holding talks with Georgian police on transferring control back to them.